After scaling back our presence in 2016, Cambridge ELT returned in full force to this year’s TESOL International Conference in Seattle, Washington. 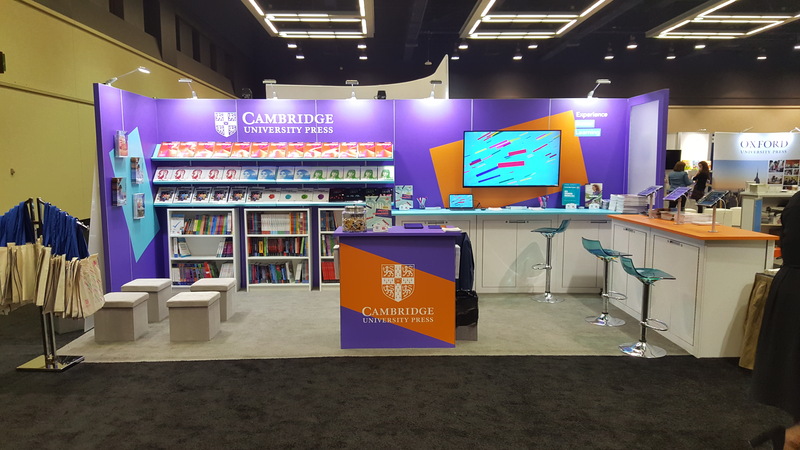 Over a 4-day span stretching from March 21-24, Cambridge University Press was all over the convention center, connecting with teachers and program coordinators wherever and whenever possible. Last year we made a strategic decision to take a step back and reflect on how best to approach TESOL. Instead of our usual full-fledged booth presence, we positioned “pop-up stands” throughout the conference center so we could ask attendees what they wanted to see from publishers at a conference like TESOL. This year we took that feedback and put it into action. The most consistent thing we heard from last year’s attendees was that they wanted to see publishers’ new products. In response, our booth prominently featured new and upcoming titles — Prism and Interchange 5th Edition — as well as Final Draft, Ventures, and Grammar and Beyond. We were also told that attendees wanted to network, both with each other and with publishers. We took that feedback and designed a booth that would be welcoming, open, and help foster interaction. We wanted to provide a space where attendees would feel comfortable hanging out and having more in-depth discussions. One of the ways we accomplished this was by providing reusable coffee mugs that attendees were encouraged to fill at our booth with complimentary coffee. These proved to be extremely popular — we handed out 1,800 mugs in just over an hour before the opening plenary – and helped facilitate a great number of interactions at the booth over the next 3 days. In order to provide a more casual atmosphere, we held a Cambridge Happy Hour at a private event space in the Hard Rock Café that gave our teachers yet another chance to meet Cambridge authors and mingle with each other. The turnout was even bigger than expected, topping out at around 250 guests. In addition to giving talks, our authors spent time at our pop-up stands throughout the convention center answering questions about their books, their sessions, and English language teaching in general. We also had a presence at Classroom of the Future, a space in the exhibit hall dedicated to technology. We spoke with lots of teachers and program coordinators about the Cambridge LMS in this space, and Jeff Krum of the New York office gave a talk on how LMSs are actually used. We would like to thank all of the teachers, program coordinators, and enthusiastic lifelong learners we met at TESOL for sharing their time with us. We hope you enjoyed your Cambridge experience, and we look forward to seeing all of you next year in Chicago.